Skating this Winter Is A GO! We Need Final Confirmation You’re In- Starting November 21st! There is sufficient interest to run a Winter skating program at the Scooter’s Roller Palace. WHEN WILL PRACTICES BE HELD? The program take place on Mondays doors open at 7:30pm for track preparation and skating from 8pm to 9:30pm. We will begin on Monday November 21st and operate the Club until Monday March 27th 2017.
WHO SHOULD COME SKATE AT THESE PRACTICES? If you can propel yourself on skates and remain fairly balanced without toppling over, if you’re can turn left and right, and if you like to go fast and want to work on your fitness & skills, and you want to do the best and coolest sport in the world with a great bunch of skaters, then come on out! HOW MUCH WILL IT COST? Even though the Club itself will pay more than in years past to rent the venue, because more people are interested in skating this year, it’ll actually cost less per session for each skater! Right now we’re looking at under $300 for the entire season. What a deal!! The final cost will be determined by how many skaters commit. The more skaters are registered the cheaper it will be to skate for everyone. If there are more skaters at the end of the season, everyone will get a proportional partial refund. So talk to your relatives, friends and neighbours! WHAT’S THE NEXT STEP? I (will send you an e-mail confirming cost, forms you have to sign, and what date practices start and practice times. I will also insist you show up 30-minutes before practice begins because we need at least 6 people to help clean, mop, and set up so we can actually begin practice on time. SPREAD THE NEWS, BE A CHAMPION FOR SKATING AND PROMOTE THIS SPORT Tell all your family, friends, even strangers! Figure out what you need to do to convince them to come out and skate with us. With your help, lets double, triple, even quadruple the number of skaters and participants we have in the GTA! I CAN’T JOIN BECAUSE (INSERT EXCUSE HERE… we are having a baby/ I am a baby/ I have to work weird hours) That’s fine, we understand (even though we really don’t). You can skate with the club as a guest. You’ll have to fill in some forms explaining you understand there’s inherent risk with skating, and you have to pay $20. This needs to be done before you skate. WHEN AND HOW DO I HAVE TO PAY BY AND REGISTER? You MUST pay before you first skate, no exceptions. You can pay cash, cheque (made out to Scooter’s Skate Club), or e-transfer (let us know and we’ll give you the e-mail address for that option). When you show up for the first practice on Monday, you’ll need to give the cash or cheque to Alain or me AND all the forms (registration and waiver). We’ll make sure everyone respects this. If you don’t bring the payment, you can’t skate. There will be no exceptions. Managing this Club takes a lot of work and we can’t spend time chasing down individuals to be responsible. On top of the floor fees, you will also be required to pay $20 that goes to the Club itself. This goes to pay for vinegar to clean the floor we skate which makes it grippy (significantly less slippery, much better quality practice), laundry for the towels we use to mop the floor with, replacement mops, first aid equipment, RSC Membership fees for the Club (liability insurance for the Board). CAN I BUY A PACKAGE OF PASSES LIKE LAST YEAR? No, we phased that option out. When you register, it’s for the whole year. We are a Club, we are a team, so we expect everyone to show up and put their best effort forward. WHAT ABOUT CANCELLED PRACTICES? WILL THEY BE MADE UP? No, this year, in the event of practice cancellations, they won’t be made up. The Club will not pay for renting the venue for cancelled practices, and everyone who paid for those times will be reimbursed proportionally. I CAN’T JOIN UNTIL JANUARY OR FEBRUARY That’s fine. You can join when you’re ready. You’ll pay the exact amount of money PER practice as everyone else. It’s a fair deal. WHAT HAPPENS IF NEW SKATERS COME? Great! We’ll be happy, and make sure you’re friendly and inviting, and give them space to enjoy practice safely!! We’ll help them out and teach them about proper track protocol and etiquette. Also, after you have paid, anybody who signs up and pays means you will get a portion of your fees back at the end of the year. This is because the fees you paid at the start of the year will cover the floor fees for the entire season. Comments Off on Skating this Winter Is A GO! We Need Final Confirmation You’re In- Starting November 21st! Alain Quintard and I met with Scooter’s Roller Palace management this past Thursday to discuss rink availability and costs associated to booking the rink to run an indoor winter skating program for the Scooter’s Indoor Speed club. We had a fruitful discussion, agreeing on terms and conditions to operate the Club out of the roller rink. We’ve been offered days and times listed below as potential skating opportunities. Please let me know by contacting torontoinline@yahoo.com which of the following days you will definitely commit to skate on. We need to know how many of you WILL skate this winter, as this will dictate fees and allow us to create the best schedule. This year we will offer a very different fee structure than in years past to skate at the Scooter’s Indoor Speed Club. This is necessary because we now have a fixed rate for renting the rink. Given that membership fees are closely linked to the costs of operating the club, and that the largest expense for the club is paying for floor time (roller rink rental), the greater number of skaters who skate at Scooter’s makes for lower fees to skate. If interest is low or insufficient, fees will be higher, and we may need to reconsider skating this winter at Scooter’s. Please let me know by OCTOBER 25th which of the following times you will skate, including how many days per week you’d like and what your preferred choices are. If you select Sundays, let me know if you wish to skate on December 25th and January 1st since these days happen to fall on Sundays. 1) A CALL FOR HELP WITH COACHING/ RUNNING PROGRAMS/ INSTRUCTION: We need assistance with running practices- instruction/ coaching/ managing the program. If you’re interesting in, and willing to lend a hand with this, please let me know by e-mailing me at torontoinline@yahoo.com. You’ll be offered assistance & support, and may possibly be compensated. 2) Cancelled practices will be made up either by using the next available time slot in the week, or by adding extra time (30-minutes) to already existing practices. Mondays are prone to a number of cancellations due to the rink booking Winter Holiday parties and commercial & photo/ video shoots. Once I have collected all your responses, we’ll look to offer the most suitable skating times at the best possible cost. TISC’s Year End Party & Awards will be held SATURDAY November 5th at 7pm. In a previous communication, I mistakenly wrote Friday November 5th. I am confirming the party will be held on the Saturday the 5th. We are ALWAYS looking for volunteers to help pitch in to sustain and grow our amazing sport. If you’d like to be involved with TISC and/or Roller Sports Canada in any capacity, please let me know. We need help with promotion, social media outreach, event organization, coaching and instruction programming and delivery, officiating, recruitment. The are numerous ways for you to become involved an a variety of depths in which you can become engaged. Please contact torontoinline@yahoo.com and we can discuss how you can become involved! Warmer weather and little snow this winter made it seem like there was hardly a winter at all this year. As Spring quickly approaches, so ends of the 2015-2016 season for the Scooter’s Indoor Speed Club. Only two practices remain this year: March 14th will start later with doors open for floor cleaning at 9:10pm, and skating 9:40pm to 11:10pm. March 21st practice will be held at the regular start-time, with floor cleaning at 7:30pm and skating at 8pm. Please note that due to Family Day public skate on February 15th as well as a private booking of the rink the following week, the Scooter’s Indoor Speed Club practices for February 15th and February 22nd have been cancelled. The Club will meet again next on February 29th. This racing video from France should give you a pretty good idea of what the speedy members from the Scooter’s Indoor Speed Club are working towards. This is a reminder that Pajama Day for the Scooter’s Indoor Speed Club will be held at the January 18th practice. Don’t forget to bring & wear your sweetest pajamas for skating practice. There will be an award to for best pajamas. I will be the judge. Obviously, this will be a excellent practice. Surely everything will go well. Maybe we’ll do flying laps or some sort of time trial. I’m going to skate the entire practice in my Calvin Klein pajamas. Also, don’t forget the next annual Swear Practice (Curse Word Practice/ Swear Day) will be held on the first skate of 2017. Cue up your harshest curse words in English and French (or any other language). Don’t forget to keep things respectful: no discrimination or harassment (racism, sexism, hetero-sexism, etc). The next Scooter’s Skate Club practice will be held Monday January 4th 2016. As usual, doors will open at 7:30pm and skate begins at 8pm. Please arrive early to help prepare the floor for practice. The next two Mondays (December 21st and 28th) are cancelled because the Scooter’s Roller Palace will hold public skate sessions. We would like to wish you a all wonderful Winter break, no matter what you do, and no matter which Celebrations you & your Loves Ones do or do not observe. Happy Hanukkah, Merry Christmas, Happy Kwanzaa, and Happy New Year! Be safe & healthy, have fun, enjoy time with your Love Ones and Friends, and keep in-touch. In keeping with tradition, the first practice of 2016 will be Swear Day. Be ready to use your all your expletives- in French, in English! See you all in 2016! We are pleased to announce that the Scooter’s Indoor Speed Club will begin its 2015-2016 indoor inline skating program on Monday November 2nd 2015. Doors will open at 7:30pm and skating will begin at 8pm and finish at 9:30pm. The season will come to a close on March 28th 2016. Skating will be held weekly- Mondays 8pm to 9:30pm with doors open at 7:30pm. Please plan to arrive for 7:30pm and be ready to help out. We need 6 volunteers to help with set up: four people to clean the floor (1 to mix vinegar & water and one to put up protective mats while 2 dry mop on skates, immediately followed by four to dry-mop and vinegar). It is impossible to start skating at 8pm unless we have volunteers who arrive early and immediately start with preparing the floor. Helmets are mandatory. Additional protective equipment (wrist guards, knee and elbow pads) is recommended but not mandatory. The program will start with a focus on safety, how to safely skate in groups/ safe passing/ getting passed safely, and track pattern. For now, the program is open to those who are able to stand and are stable on skates, can start rolling on their own, are able to hop/ jump over small obstacles, and able to turn right and left. The complete fee structure will be published this week on this website. Also, I plan on updating the website with this year’s information later this week. PASS IT ON, GET THE WORD OUT: If you know anyone you think could be interested in skating with the Scooter’s Indoor Speed Club, please pass along this message. VOLUNTEERS NEEDED: We are always looking for volunteers to help with running and managing the Club. If you’re willing to help in any capacity, please get in touch with me by replying to this e-mail. Areas where volunteers are required include running programs, coordinating set-up and clean-up, website management, promotion of the club, communications with members, registration and check-in (paper work), coordinating members for attending competitions. We need the skating community to step-up and take initiative and ownership because running a Club (as well as with most parts of this sports) relies almost exclusively on volunteer contributions. 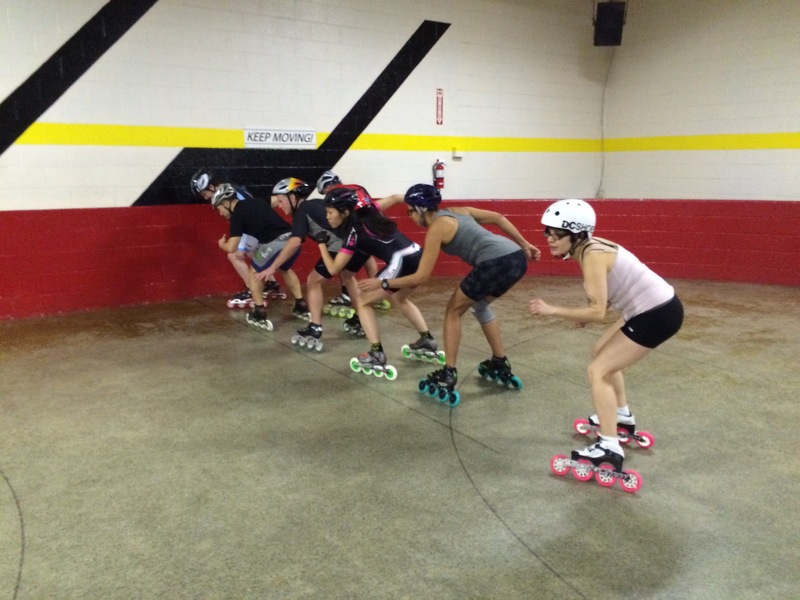 The Scooter’s Indoor Speed Club closed its 2014-2015 season on Monday March 22nd. The Club aims to resume in the Fall of 2015. The Toronto Inline Skating Club will likely start its 2015 outdoor skating season on April 9th.